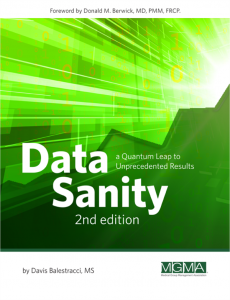 "I rarely, if ever, write to authors telling them how good (or great) I think their book is, but I had to tell you that I am reading your book “Data Sanity” and I think it is one of the best quality related publications out there. Although I do not work in medicine (I working as a lead in quality (amongst other things) for a large child welfare organization), so far I have found many helpful (and confirmatory) pieces to your book. I guess it also helps that it appears we have a similar mindset when it comes to approaches organizational quality! Noticed your website and the references to music – maybe that’s the connection – my first degree is in music! Thank you!" Until quality concepts permeate an organization’s culture to the point where the words “statistical” and “quality” are dropped as qualifiers because they are givens, any “dark-green dollar” savings will be nickels and dimes compared to what is truly possible. Many organizations are still locked into the mindset of quality as a “bolt-on” program rather than the strategy for developing a strategy. And the “guru vs. guru wars” continue, which means that people still don’t get it. In essence, he and I agree. This person does indeed get it, and I apologize for any others I may also be offending. But the comment got me thinking. There is a message that always bears repeating: Total quality management (TQM), continuous quality improvement (CQI), Six Sigma, LSS, and the Toyota Production System all come out of the same theory, which truly hasn’t changed in the last 22 years. And, by the way, did you notice that my reader’s comment included the term “project by project?” I’m not sure that approach (on which Juran’s success was based during the 1970s and 1980s) is going to be effective any more. As I’ve tried to show, this thinking must also infiltrate the everyday management of any organization. Quality, when integrated into a business strategy, is present in virtually every aspect of every employee’s everyday work. Process-oriented thinking is the anchoring concept of any good improvement framework and creates a common organizational language that will reduce defensiveness. It’s not the problems that march into your office that are important: It’s the ones of which no one is aware. And then there’s that statistical conundrum: Some lean purists argue that statistics have absolutely no place in the discussion, while the Six Sigma pros contend that it’s all about statistics. It’s become a sort of modern-day “How many angels can dance on the head of a pin?” debate. Don’t you think your time would be better spent considering how you can use your knowledge and experience to help your company move away from quality as a bolt-on program to a built-in culture change?